Flower Girl dresses can often put the 'wow' factor in a bride's wedding party. We all look forward to the bride wearing a beautiful white gown. And we want to snap those photos of the handsome groom in his tuxedo. We expect the bevy of bridesmaids to have on pretty dresses, and the groomsmen to look sharp in their color-coordinated suits. We all love the little ringbearer marching down the aisle. 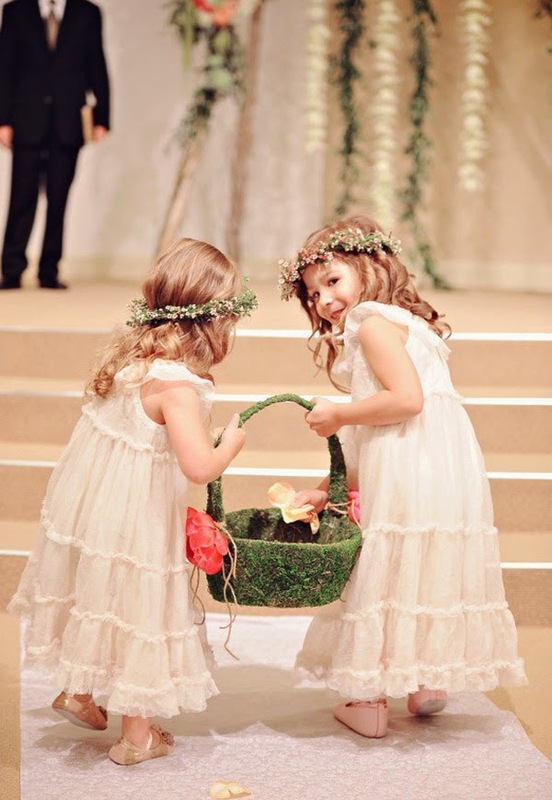 But when the Flower Girl dresses make their appearance, everyone's eyes are on the Flower Girls as they gingerly parade down the aisle right before the bride. It's the Flower Girl dresses that cause the wedding guests to smile and get teary-eyed at the thought of little girls growing up. Flower Girl dresses make flower girls feel like Cinderella. And they make the Flower Girl's mother and father think about the day when she will get married someday. The sight of their little girl in a lavishly fashionable dress makes them fast-forward to the prom, to boyfriends, to college, and to her wedding day....all as they watch their little princess tossing flowers before the bride. 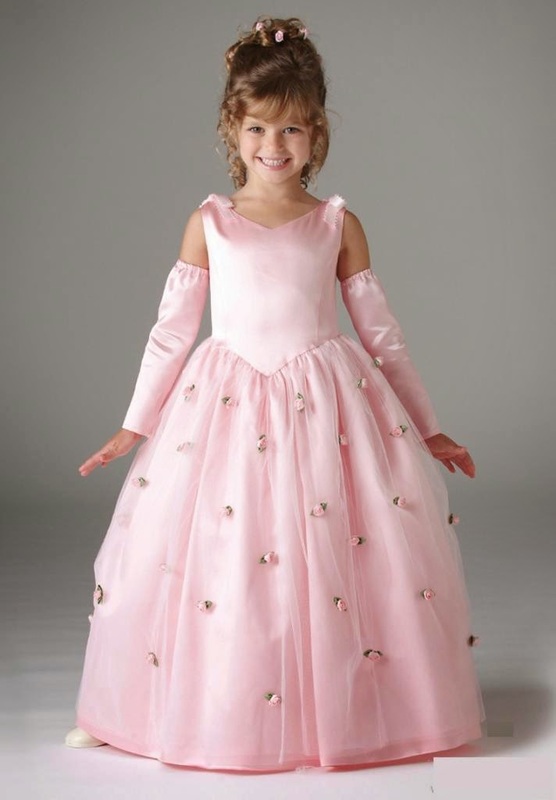 Flower Girl dresses are often specially-made for the girls who precede the bride down the aisle. These dresses are very often of high-quality fabrics and made by meticulous seamstresses. Brides who have expensive weddings will often choose Flower Girl dresses that sometimes rival the cost of a bridesmaid's dress. White is absolutely the color of choice for Flower Girl dresses. Some of the more ornate designs can look like miniature bridal gowns, although they are usually not full-length dresses since that would make it more difficult for the flower girl to walk freely, and she could risk tripping on her way down the aisle. Some of the luxurious fabrics used in Flower Girl dresses are: organza, silk, satin, and tulle. The most popular style of dress is most often loose and not fitted to the body, frilly and feminine, at times with puffed sleeves and at other times with a rich pastel ribbon on the dress to give it a little pop of color. Modern Flower Girl dresses usually end at the middle of the calf or at the knee. If you're having a seamstress make your Flower Girl dresses, ask her to leave a generous hem at the bottom so that you can lengthen the dress later. By doing that, the girl can continue to wear the dress to parties or other special events without outgrowing it soon after the wedding. That can make it a much more cost-effective purchase for the Flower Girl's parents. If the bride has several young relatives or children of friends she would like to honor, there may be more than one Flower Girl at a wedding. Traditionally, the clothing for the wedding was provided by the bride and groom's families, but many couples today will ask the Flower Girl's parents to pay for her dress. And most parents excitedly agree and consider it an honor to have their daughter in a wedding party.